I’ve always loved Guitar Pro 5 as a quite good tool to learn and practice tabs, there are new versions, but I stick to that one. Sadly it only runs on Windows and I don’t have one anymore therefore I decided to run it using PlayOnLinux. After installing Guitar Pro 5 quite easily, I came across one main problem, I had no midi sound. The problem is not only related to Guitar pro, but is related to the need of midi with PlayOnLinux or Wine. As the man says, timidity is a “MIDI-to-WAVE converter and player”, it simply means for us that it will do the trick between our OS and the software inside PlayOnLinux. Up in ! Quite simple, we just start timidity then our software, here GP5 is the name of my virtual drive in PlayOnLinux, and we kill timidity. Yeah the kill is bad but SIGQUIT wouldn’t work, I got tired. Don’t forget to chmod it to be executable. As you may notice, line 6 is the call to our wrapper. For those who don’t know and are interested about Guitar Pro 5’s audio configuration, once you are done with the setup I’ve shown, you still need to configure the correct MIDI output. 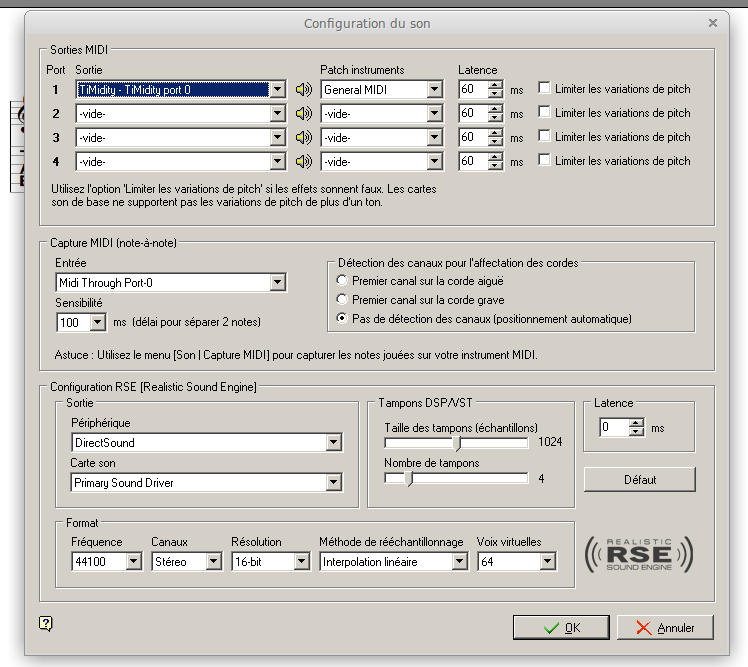 In Guitar Pro 5, go to Options > Audio Settings (MIDI/RSE). Select TiMidity port 0 as the first port output device. I didn’t use it enough yet, but I got some cracking sound sometimes, for now I save what i’m doing in Guitar Pro and restart it. I guess the problem could be solved by giving extra parameters to timidity. If I find anything I’ll let you know. This entry was posted in PlayOnLinux, System, Wine and tagged Guitar Pro, Guitar Pro 5, Midi, Sound, Timidity on 14 January 2017 by _flor3O_.